Upscale and affordable one large room apartment fully equipped located in a brand new building with Premium amenities. The bedroom area has a very cosy style, it has a queen size bed, balcony, air conditioner, LCD 32”,Internet WiFi . The living area has very comfortable sofas and a modern wood table with 2 chairs. The kitchen is totally equipped and the bathroom is complete. Every detail in the apartment hand picked for ultimate design. 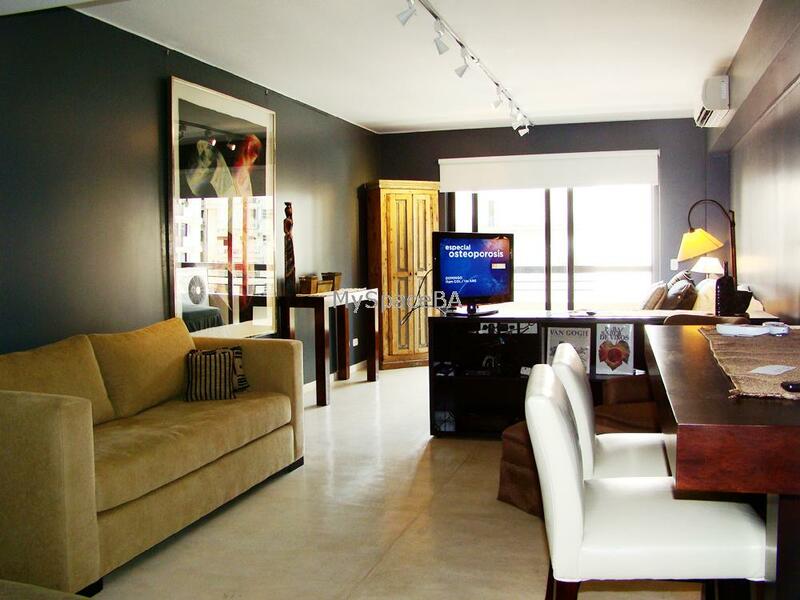 This Studio is excellent to have a great location near the most important areas of the city. Five Star brand new building with great amenities . Covered Swimming pool , outdoor jacuzi pool , garden with deck where you can relax and enjoy beautiful sunny days , sauna , laundry , changing room . Cinema , private function room . Wi Fi . Complete gymnasium . Doorman 24hs. Elevators. Plaza San Martin, Florida Street (the famous pedestrian Shopping Street), Retiro Train Station , Cruise Ship Port Terminal . Downtown . Recoleta area a few minutes away . Art Gallerys . Restaurants . Bars . Banks .